Bellevue’s sleek twin Bellevue Towers condominium development has obtained FHA approval. This is rather significant in light of (1) this has always been marketed as an upscale, luxury condomionium and (2) FHA approval opens to door to a much larger pool of buyers for the project. The current FHA loan limit is $567,000 and requires only a 3.5% down payment. 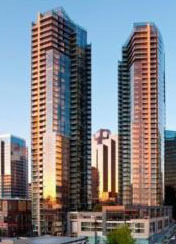 Additionally, Bellevue Towers reports nearly 20 additional home sales in the past three months. The project was designed to meet LEED Gold certification requirements and features outdoor green spaces and fantastic residential amenities. Commercial businesses that recently opened at Bellevue Towers include Purple Cafe and Barrio Restaurant. Bellevue Towers is a very well liked project. The biggest unknowns were simply the direction they were taking to “meet the market”. Hopefully this will open the door for more success. They could use it. We have a lot of condos in Austin, Texas too and being FHA appoved is so important because it leaves the window open for a lot more buyers, especially first time buyers. I am glad to see this is a green project! Wonderful!